Update: Version 2.2.0 is now available (February 2013), for PC (Mac coming soon). See installation information below. Note: We recommend NOT using the Windows extractor to unpack the .zip file containing the DataViewer, as the Windows extractor has trouble with complex zip archives and long path names. We recommend using WinZip or 7zip. Prior versions of the DataViewer required the user to download NetCDF .dll files and the .NET Framework. This is no longer required, as the latest version of the DataViewer is Java-based. All necessary files are included in the zip file (see below), except for the Java installation. Users will need to have 32-bit Java Virtual Machine (JVM) installed on their system before they can run the DataViewer. The 64-bit JVM causes issues with the DataViewer, so if you are running a 64-bit system, please ensure you have the 32-bit JVM installed, not the 64-bit one. Most machines will have the 32-bit JVM installed. Please contact us if you have questions. 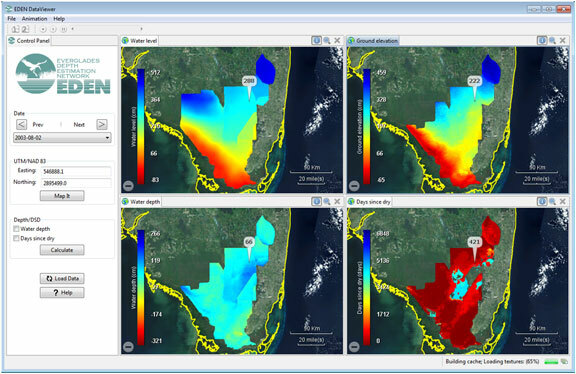 The EDEN DataViewer is a program for viewing the daily EDEN surfaces of water level and ground elevation from the ground surface digital elevation model and creates daily surfaces of water depth and days since last dry. The user can view all or a selected area of the EDEN domain and the surfaces can be animated over time. Data values for each surface are reported for user-selected UTM-coordinate locations. Prior versions of the DataViewer required the user to download NetCDF .dll files and the .NET Framework. This is no longer required, as the latest version of the DataViewer is Java-based. All necessary files are included in the zip file (see below), except for the Java installation. Users will need to have 32-bit Java Virtual Machine (JVM) installed on their system before they can run the DataViewer. The 64-bit JVM causes issues with the DataViewer, so if you are running a 64-bit system, please ensure you have the 32-bit JVM installed, not the 64-bit one. Please contact us if you have questions. EDEN DataViewer zip file (.zip, 116 MB, currently at 2.2.0, Version 2 released February 2013). The .zip file can be saved to any location on your computer. Select the appropriate version for your system. Please see note above about unzipping the .zip file.